Researchers from Europe managed to successfully synthesize germanene - a 2D material that is similar to graphene and made from Germanium atoms. The material was first propose in 2009, but now it was finally realized. Back in 2009 it was suggested that Germanene can be made by high-temperature deposition in a ultra-high vacuum environment. But the breakthrough in this research came when they used gold as a substrate. An independent group from China also managed to synthesize germanene - and they have used a platinum substrate (which is more expensive than the thin gold films used in the European research). Germanene is a room-temperature topological insulator, which may applications in quantum computing. It does not appear in nature. 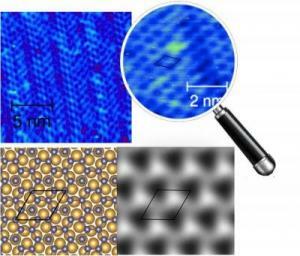 By the way, this material is Germanene, a single layer of germanium atoms with no attachments. There's a very similar material called Germanane, which is a also a single layer of germanium atoms, but in this case the material is hydrogenated at its ends (iit has hydrogen atoms attached to it). Germanane was first realizes in April 2013. A graphene that is hydrogenated at its ends is called graphane, a promising insulator material.